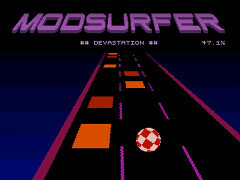 ModSurfer is a rhythm game, developed by Arcanist, for the classic Amiga computers. In the game you select a MOD music file from your collection and ride the rhythms to victory. A demonstration video of ModSurfer on YouTube.